Leonardo Da Vinci: Steve Jobs, Henry Ford and Bill Gates rolled into one? Recognised as one of history's greatest artists, responsible for the Mona Lisa and The Last Supper, Leonardo da Vinci was also an exceptional free thinker, draughtsman and tech head. A new exhibition at London's Science Museum concentrates on the machines that Leonardo drew, featuring 3D-models made from the Italian polymath's revolutionary technical designs, alongside games and interactive displays. 1. He designed this incredibly creepy, military diver gimp suit. One of Leonardo's more militant designs was as admirably forward thinking but immensely sinister diving suit. Designed while working in Venice, and looking like something from Bioshock, the suit was crafted from leather and fitted with cane air tubes reinforced with steel rings to stop them from being crushed by water pressure. The suit was fitted with glass eye holes, a leather bag with a valve to help with submersion and resurfacing and even a handy urination bottle in case the diver needed to stay underwater for extended periods. The idea was that the suit would be used to attack enemy ships by stealthily cutting holes in the their hulls, using a special drill that Leonardo had also designed. 2. In fact, for someone who despised war, he designed an awful lot of deadly weapons. Despite his distaste for fighting and respect for the natural world, Leonardo designed a remarkable number of killing machines. The art of war was big business back in the 15th century and so Leonardo inevitably found himself working on numerous fortifications and weapons including early attempts at armoured vehicles along with smoke machines, portable bridges, a preposterously large crossbow and lots and lots of cannons. Leonardo's studies on trajectory and projectile impact were revolutionary at the time, andhe was even hired by the infamous, Machiavellian nobleman Cesare Borgia to work as an architect and military engineer. Leonardo was a pioneer in looking to nature for technological solutions. And we're not talking about the 'inspired by nature' marketing waffle as spouted by some tech companies, but genuine biomimicry. Not only is this influence obvious in his flying machines that resemble birds, but it's also present in less obvious subjects such as a church design based on a budding flower. The exhibition includes several modern examples of bio-inspired engineering such as the production of imitation spider silk, fish-like robots and aeronautical engineering inspired by birds. 4. He sort of invented the helicopter. The notion that Leonardo actually built a Rennaissance chopper retains a firm hold on the popular imagination, depite being demonstrably untrue.Yes, he did sketch a concept called the Aerial Screw, but even with our lack of aerodynamic engineering experience, we can see that this machine, with a spiral-shaped blade rotated by a central shaft pushed by two people standing underneath, would never have got off the ground. You know, due to physics. Leonardo never built the device,but centuries later, models have been produced from his sketches. They don't fly, obviously, but the huge leap of imagination involved in envisaging a flying machine based on a rotating blade, rather than fixed or flapping wings,450 years before the actual helicopter was invented, is still hugely impressive. While Da Vinci created an impressive portfolio of designs, many of thetechnical sketchesthat Leonardo produced were not his own inventions, but merely improvements to existing mechanisms, or simply more effective renderings. While numerous Renaissance engineers were doing exactly the same thing, Leonardo's exceptional talent for reinterpreting three-dimensional ideas on paper made them stand out. Most of his ideas, whether his own inventions or modified contraptions, were never actually meant to be built, but were simply produced to showcase his skills to wealthy patrons. 6. He created incredible stage designs. Leonardo was responsible for many highly technical stage designs, using increasingly sophisticated machines. Elaborate stage design was a highly prized skill during the Renaissance, not only for theatrical productions, but for grandstanding at events such as weddings. 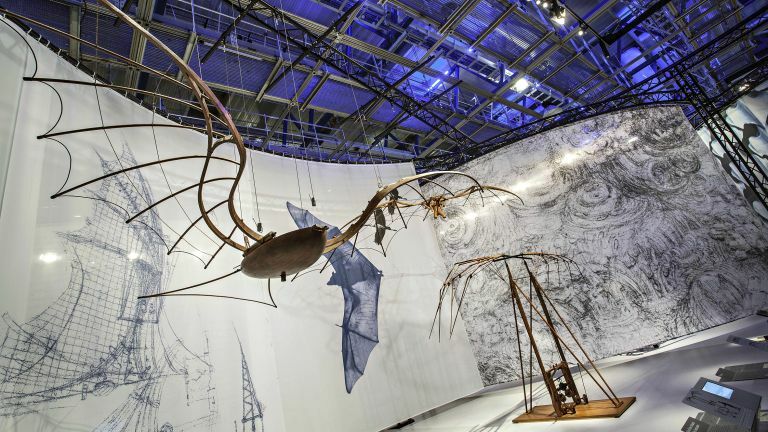 Leonardo's ingenious designs made use of mechanical gadgets, including weights and pulleys to create an interactive backdrop to ramp up the action. he was one of the first to use revolving stages to create theatrical spectacles. 7. His greatest invention was his drawing itself. While Leonardo may not have actually come up with many 'inventions' in the sense that we now understand them, his legacy is his revolutionary drawings. Superior in quality and detail to the work of his peers, they set the standard for technical drawing as we know it today. While many other inventors and engineers had put their ideas onto paper, it was Leonardo who was the first to sketch tiny components in immaculate detail. He also pioneered the use of cross-section sketches and 'exploded' diagrams to show how components fit together, while his ground-breaking anatomical drawings set the standard for hundreds of years.